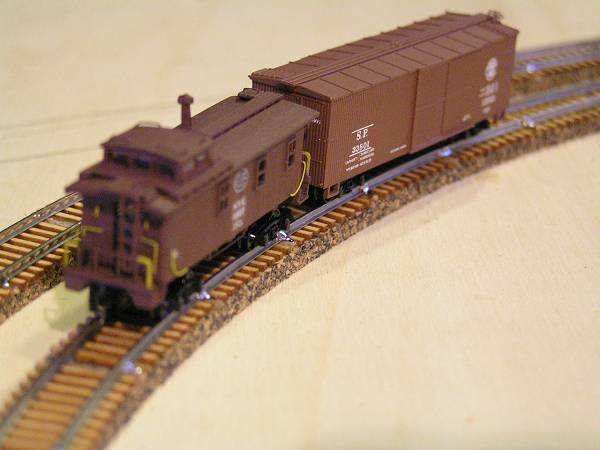 I needed a couple Balloon Turnaround modules so I can run trains on my Z Bend Track modules. 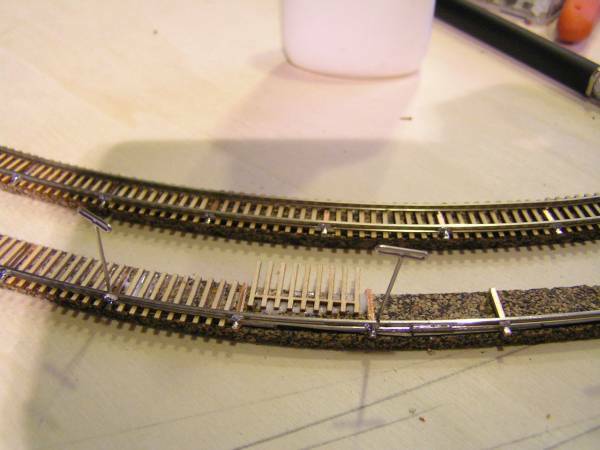 I decided to handlay the rail as apposed to using the Micro Trains track because there would be too many rails joints due to the short length or their flextrack. I made this jig to build my own flextrack with. I just fill the slots with PC Ties, apply a little flux, lay the rail in the slot, and solder the ties to the rail. 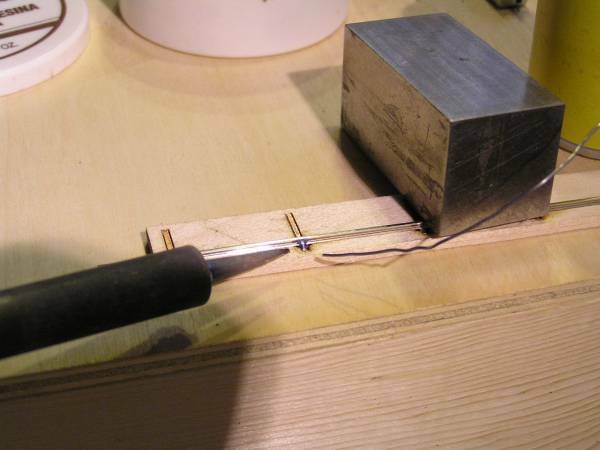 I use a steel block to hold the rail down while soldering the ties on. After all the ties in the jig are soldered to the rail, I lift out the flextrack rail, drop more ties into all the slots except the last one, and lay the rail back in the slot with the last tie soldered going into the remaining tie slot. This keeps the 1" PC Tie spacing perfect. Now for the Superelevation. 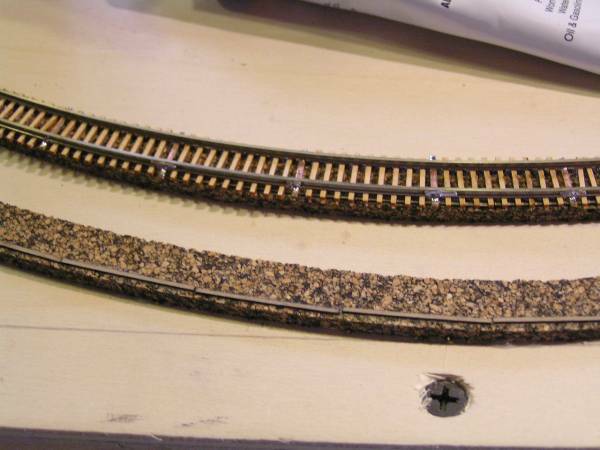 I glued 1/64" thick 1"x .040" shim sticks to my roadbed, placed just about under where the outside rail will sit. 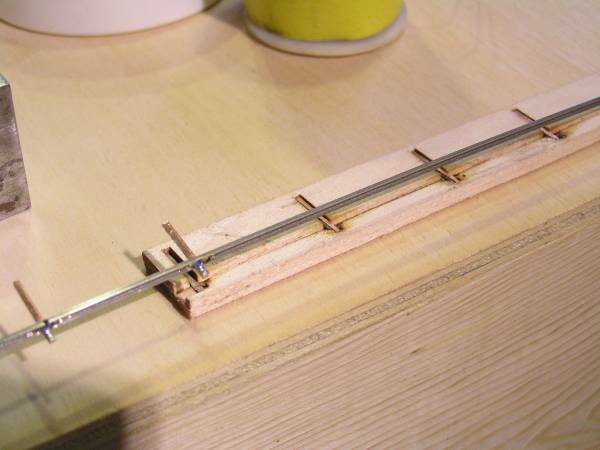 As this scales to Z Scale, it will raise the outside rail a scale 4" higher than the inside rail. 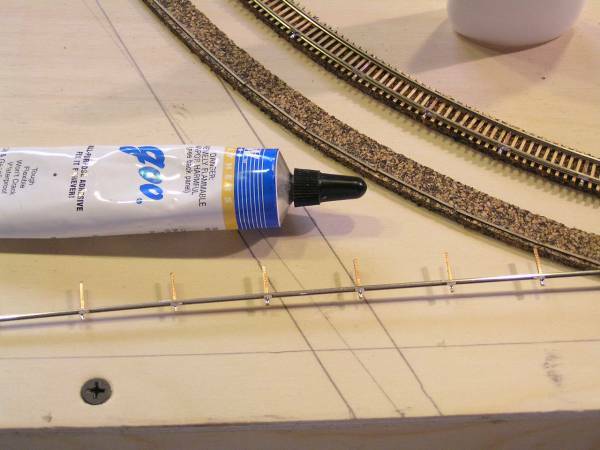 Now I glued the PC Ties down with Walthers Goo, a form of contact cement in an easy to dispense tube, aligning the rail just above the shim sticks. I held them in place with the steel blocks and sometimes just my coffee cup. The glue tacks up quick, but I use T Pins to hold the rail in alignment for an hour or so. 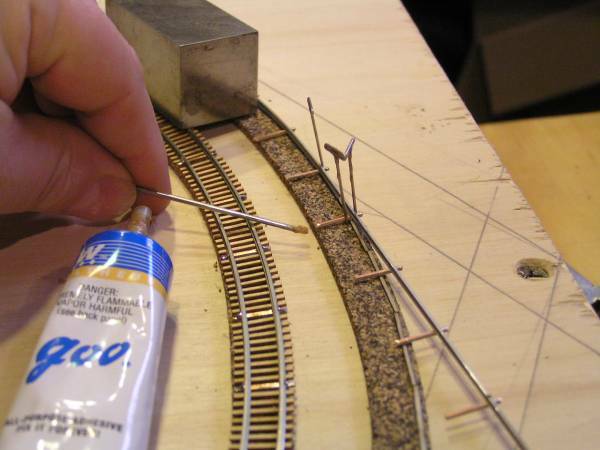 I also add a little extra Goo where the ties lift from the roadbed, and weight them down till the Goo sets. Sometimes you run a little short of rail. 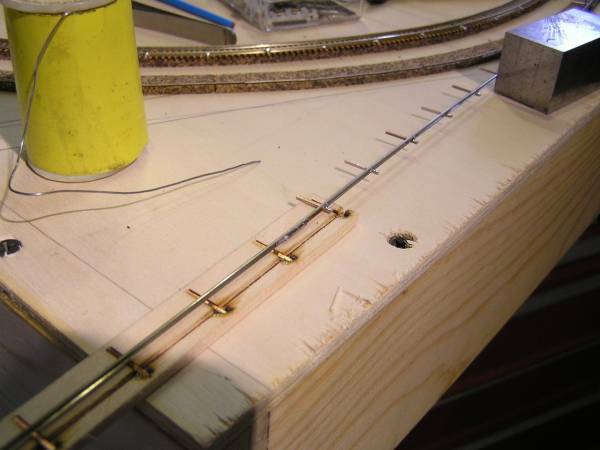 This can happen in the middle of laying the rail, but not to worry, just solder a rail joiner on, and use the jig to add more properly spaced ties to the extra rail. 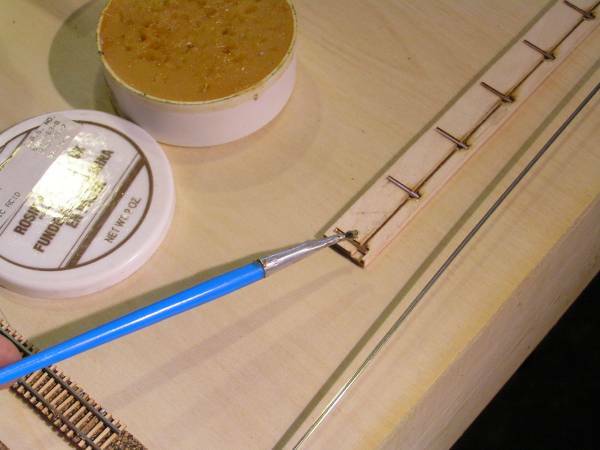 Here you can see the jig loaded with ties, ready to solder to the extra rail length. Once the outside rail had been glued down and the glue set, I use white glue, and slide a precut Tie Strip between the PC Ties. The Tie Strips have 9 Z Scale 7"x 9"x 9' long ties, to match with Micro Trains flex ties, and are attached at a point that goes under the rail. 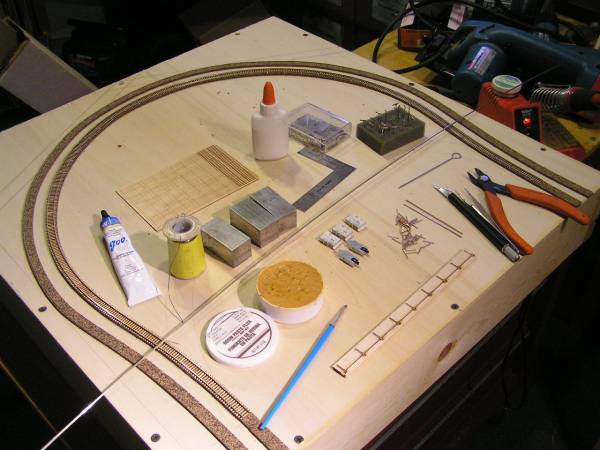 A guy can lay this form of handlaid flextrack real quick using the jig, and tie strips. The next step, after all the tie strips are glued down, is to solder the inside rail down. 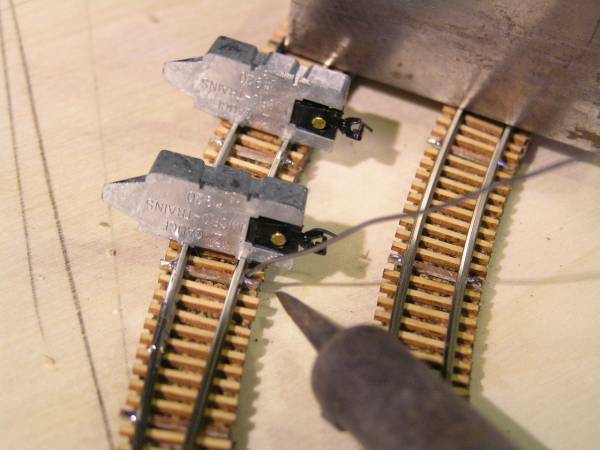 I used the Micro Trains Z Scale Coupler Height Gauges for track gauges. They work well with code 55 rail, which is what I used here, but are a little sloppy for use with code 40 rail. 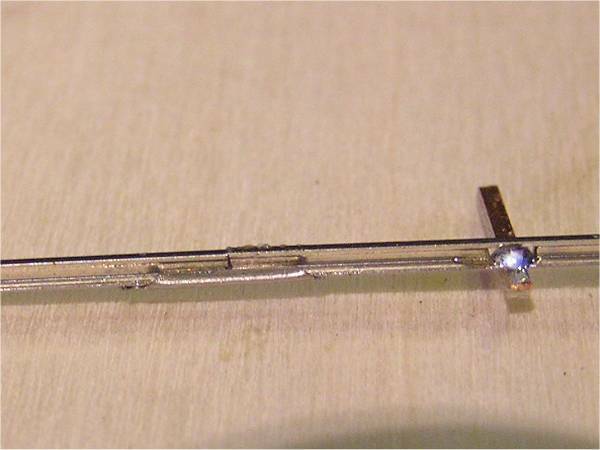 I still use them for code 40 rail though, as the critical points are only with the turnouts. And after the tracks were laid, I rolled a couple cars at high speed around the turn to see how the superelevation performed. It works pretty good, and cars have a cool looking lean as they bank into the turns.